Sean Dyche said that he was "flummoxed" by referee Anthony Taylor's decision to deny the Clarets a first half penalty, adding that it would have been a travesty had the Southampton held on for three points. 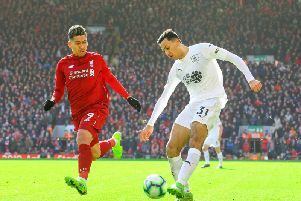 Rather than having the opportunity to open the scoring from the spot, when Ashley Barnes was upended by Saints stopper Alex McCarthy, the Burnley striker was booked for what Taylor deemed to be simulation. Ralph Hasenhuttl's side went on to take the lead 10 minutes in to the second half when Nathan Redmond beat Tom Heaton from distance. However, with just 10 seconds of the four minutes added on remaining, Taylor awarded Burnley their first penalty in 68 league games. Barnes drilled home from 12 yards out to make it 1-1 and stretch the Clarets' unbeaten run in the Premier League to six games. "It was a deserved point, it would have been a travesty if we at least didn't get a point," said Dyche. "It was a very thorough performance in many ways, apart from maybe the very start of the game and then the first 15 minutes of the second half. "I thought they started that brighter than us, scored a goal. They hadn't created that much, I was pleased with the big early save from Tom Heaton which was a good chance for them. "I thought we defended very well other than that. The chances we created were enough to at least get something from the game. "The hardship is that we had a big decision late in the game at Watford which is onside, we know that now. I thought there was some strangeness to the finish of the game at Old Trafford which can go for us rather than against us, and today I was flummoxed." Dyche continued: "I can't believe what I have seen when he hasn't given us a penalty. Some people might disagree with me but that is as clear a penalty as I have seen in a long, long time. "There is no question on any level I don't think. The keeper tries to do his job, that is fair enough, the player tries to do his job, he gets there first and toes it past him, the keeper brings him down. "If that doesn't get given as a penalty and we see some of the madness of the game at the minute and how penalties are getting given when people get a touch on the arm and their legs buckle, that worries me. "But, I am so pleased we did eventually get a penalty with the second one, which was equally a penalty. "If that wouldn't have got given I don't know how I would have conducted this because that would have been just mental."